October 25 | Collectors' Forum at Old Sturbridge Village | Skinner Inc. Please note: Lunch and morning coffee is included. David Schorsch, a nationally renowned American antiques dealer and scholar, will speak about his many successes in unearthing masterpieces of early Hingham and Shaker craftsmanship. David has worked with numerous national museums to help grow their collections. He also co-authored, Expressions of Innocence and Eloquence, Selections from the Jane Katcher Collection of Americana, which he wrote with Eileen M. Smiles. 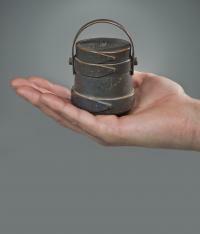 Derin Bray, co-curator of the exhibit Bucket Town, and an art & antiques consultant, will speak about Hingham’s history as the woodenware capital of the country, earning the nickname “Bucket Town.” By the 1770s enterprising coopers had begun to produce miniature versions of these goods to sell as keepsakes and novelties. From their shops emerged the first and largest community of professional toy-makers in America. The recent discovery of a 1830s fully-intact toy and box-making shop in Hingham provides a rare opportunity to see inside this world. Derin will discuss the discovery of this shop, its contents, and how it fits into the greater picture of Hingham’s rich history. Derin is the author of Bucket Town: Woodenware & Wooden Toys of Hingham, Massachusetts, 1636-1945 SV’s exhibit, Bucket Town: Four Centuries of Toymaking and Coopering in Hingham. He is also co-author of To Please Any Taste: The Furniture and Furniture Makers of Litchfield County, 1780-1830 and is a contributing author of the landmark book Harbor & Home: Furniture of Southeastern Massachusetts, 1710-1850. Bob Mosher, a decoy carver of national acclaim, as well as a scholar on the topic, will speak about the history of Hingham’s decoys carving which grew up alongside the town’s coopering and toymaking industries. Bob has gathered many awards for his work, including first place in the Ward World Championship Wildfowl Carving Competition. In 2010, Mosher was one of 16 master decoy carvers in the country (and the only one from Massachusetts) chosen to teach students the craft through a program funded through the National Endowment for the Arts. Jean M. Burks was the Curator of Recreational Artifacts at the Strong National Museum of Play in Rochester, New York. She is currently the Chief Curator at Shelburne Museum, Vermont, where she was responsible for reinstalling and reinterpreting the extensive 19th century toy and doll collections and the author of the accompanying catalog, The Dolls of Shelburne Museum. Her presentation will explore the handmade and mass-produced toys for American children made of a variety of materials which reflect society’s social customs, current events and manufacturing ability from 1800-1930. • Curator’s tour of Bucket Town: Four Centuries of Toymaking and Coopering in Hingham exhibit. • Demonstrations of OSV’s sawmill which is erected on the site that David Wight (1761-1813) first prepared in the 1790s. Today, a recreation of the 19th century Nichols-Colby Sawmill of Bow, New Hampshire, shows guests how an up-and-down saw prepared wood, an important resource for local cabinetmakers. • Demonstrations by Old Sturbridge Village coopers showing traditional practices of the trade. The OSV cooper shop was originally owned by Maine artisan James Nash and dates to around 1840. This entry was posted in Event and tagged antiques, Hingham, new england event, Old Sturbridge Village, toymakers, toymaking, toys by Skinner. Bookmark the permalink.